The head of Cairo University on Monday made official a previous decision to ban political activity on campus by announcing a freeze on groups affiliated with three of Egypt's most prominent political parties. Gaber Nasser said in press statements that groups affiliated with the Constitution Party, the Strong Egypt Party and the Salafist Nour Party have been frozen due to partisan activities not being allowed on campus. Many members of these groups are already members of the university's student union. 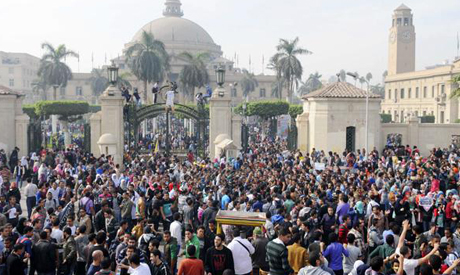 Earlier this month students protested at Cairo University against the decision to ban politically-linked groups on campus. "No political society, whether supporting the regime or opposing it, will be allowed to work on campus," Nasser told the press after a meeting with the deans of the university's faculties. The next academic year at public Egyptian universities will start 11 October. The usual start date of 21 September was pushed back according to what officials say was a need to finish maintenance work on student dormitories. Nasser also announced that the deans' council issued an order to ban protests in student dormitories. "The student dormitory is not a place for protesting and partisan differences," he said, adding that any student who violates these orders will be expelled immediately without an investigation from the student's dormitory. "These protests and violent acts are considered a danger to student life," said Nasser. The last academic year in Egypt was especially turbulent at universities nationwide, with near daily protests in the aftermath of president Mohamed Morsi's ouster in July. The protests often turned into violent standoffs with security forces, with 14 students killed in the on-campus clashes. Hundreds of other students have been jailed for illegal protesting or causing violence. Similar amounts have been suspended or expelled for protesting. A protest law issued by interim authorities last November banned all demonstrations not pre-approved by the police.